Rolls Royce Silver Shadow 1 originally fitted 8.15-15 Crossply. We recommend fitting 205 VR 15 PIRELLI CINTURATO ™ CN72 (until 1973). Shadow 2 and post 74 Shadow 1 fitted 235/70VR15 Avon Turbosteel . We recommend 235/70 HR 15 Michelin XVS as the asymmetric tyre dramatically improves it’s handling. Rolls Royce Silver Shadow 1 tyre pressures (with 205VR15 radial tyres) 34psi front and rear. Rolls Royce Silver Shadow 2 tyre pressures (and late Shadow 1) 32psi front and rear. The Rolls Royce Silver Shadow 1 from 1966-1974 fitted an 815x15 cross ply tyre. The radial alternative is a 205x15, in either Avon Textile or 205 VR 15 PIRELLI CINTURATO ™ CN72, both options will make the car more useable. Longstone tyres would recommend the 205 VR 15 PIRELLI CINTURATO ™ CN72 as the best tyre for a Rolls Royce Silver Shadow 1. Today we spend so much time cruising on dual carriage ways and motorways, a radial tyre such as the PIRELLI CINTURATO ™ will improve the cars directional stability. 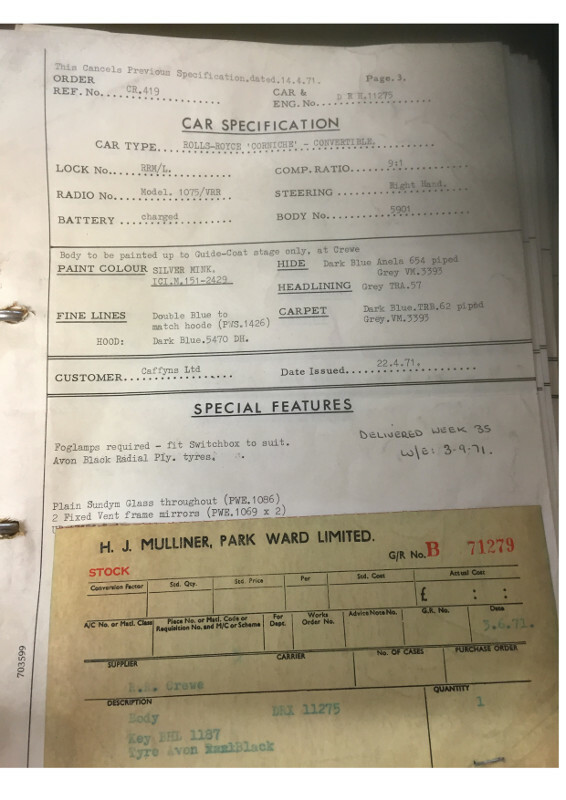 Having had a trip to the fantastic Rolls Royce archives in Paulersbury and scanned through the build sheets for these early Series 1 Silver Shadows there was a mixture of tyres used, Firestone, Dunlop and Avon tyres, some white wall and some black, but all tubeless. Pre 1970 I only found two references to radial tyres, using the Dunlop SP 41 fitted with inner tubes. This tyre is not currently manufactured. The SP41 was Dunlop's early attempt at making a radial tyre. I was surprised to find that none of these early cars fitted the 205 VR 15 PIRELLI CINTURATO ™ CN72 that we recommend today. The PIRELLI CINTURATO ™ came out in 1964 and was the tyre of choice for other car manufacturers and was fitted to cars like Ferrari 330 GT 2+2, Lamborghini 400GT, Maserati 5000 GT and also a radial option for Aston Martin with their 6 cylinder DBS. 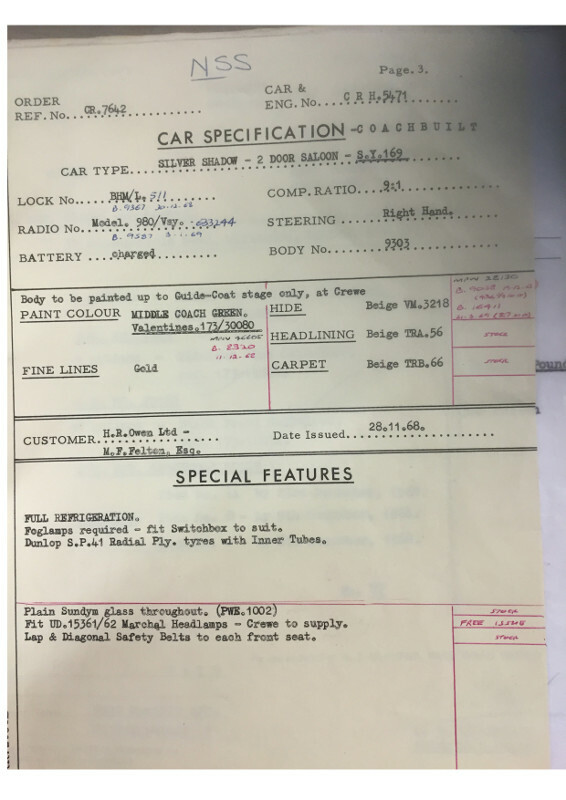 I did find in the archives that from 1970 there was a move towards fitting Avon 205VR15 radial tyres and this was the predominant tyre on these cars from 1971 to 1973. From 1974 the Rolls Royce Silver Shadow had flared wheel arches and wider wheel rims to fit more up to date low profile tyres in the size HR/70HR15 tyres. Today a HR/70HR15 tyre is called a 235/70R15. So Rolls Royce carried on to fit 235/70VR15 Avon TurboSteel tyres as Standard equipment. These are still available today for your Silver Shadow and also avalable as a white tyre 235/70VR15 Avon TurboSteel White Wall. The upgrade option tyre is the 235/70HR15 Michelin XVS-P tyre, which is asymmetric and really improves the directional stability of the Silver Shadow and diminishes the wandering at cruising speeds. Fitting the Michelin XVS will be possibly the best and cheapest dramatic improvement to you could make to the handling at cruising speeds of a Rolls Royce Silver Shadow. Apparently Rolls Royce wanted to fit the Michelin XVS but Michelin could not support tyres being run at such low pressure as Rolls Royce wanted to recommend. Currently we would suggest for the best driving experience fit 235/70HR15 Michelin XVS-P asymmetric tyres with 30psi in the front and 32psi in the rear (you could increase this to 34/38psi for very high speed use). We can also supply Michelin XVS tyres with a white wall in a variety of sizes. The early Rolls Royce Silver Shadow 1 cars without the flared wheel arches, should fit 815X15 crossply or 205VR15 tyres on their thin wheel rims, However they can also get away with fitting a 215/75R15. Longstone have a tyre 215/75R15 Hankook with a thin white band on one side at a very good price if you are looking for a budget tyre and want a white wall. There is also the possibility of having a white wall built into the side of the 205 VR 15 PIRELLI CINTURATO ™ CN72. This is not a cheap process, but you can choose what size white wall you like and have a better quality tyre. This would be the best option for an enthusiastic driver of these cars. Please email or call us to discuss this service. The Silver Shadow post 1972, the Silver Shadow 2 and the Wraith from this period did come with the optional 235/70VR15 Avon TurboSteel Whitewall. Again we do have the ability to have a white wall tyre built into the side wall of the 235/70R15 Michelin XVS-P tyre with the white wall size of your choice, this again would be the drivers choice. For more information on white wall tyres please give us a call +44 (0) 1302 714072. Nice to hear from you, I could have told you all of this. Back in the 70's and 80's I ran a 1969 Shadow which came with cross-ply tyres which lasted about 3 months. I changed over to Michelin XVS tyres which lasted much longer and improved the handling and ride. Over the following 16 years and 300,000 miles I must have used many tyres - all XVS. My current Shadow II is also on XVS but I will need 2 new ones for the MOT in April. I already have your advert on my desk ready to contact you. For more information on Silver Shadow tyres please call Longstone tyres on +44 (0) 1302 714072.